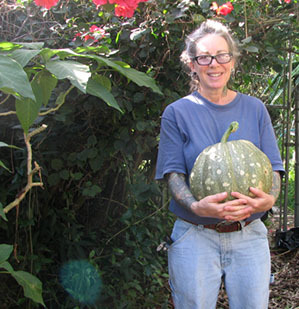 This fall and winter there is a great deal to see and to eat in my South Florida Garden. I have gained a little extra time this year to spend at the homestead garden and I can see how that is paying off. 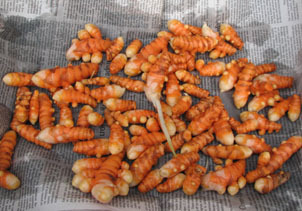 I have been harvesting turmeric and ginger that grew all summer in my garden. I am planning to grow much more next summer. 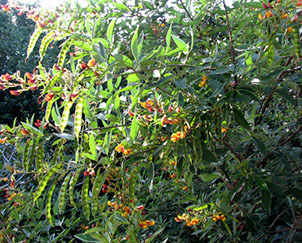 My pigeon pea plants are full of flowers and peas, and the black seed variety that I got from my Melbourne forest farmer buddy John Rogers is huge and loaded, and it barely quit fruiting from the summer before it began again in the fall. It is a more cold tolerant variety of pigeon pea than the beige seed variety, so I don’t worry about it a bit when the temperatures drop. It has been warm enough this winter that I have also been getting a decent harvest from the beige seeded variety of pigeon pea, and that is my favorite type to eat. I had a strange winter pineapple, full sized and still green, hidden in the back of a mass of pineapple plants, all of which fruited properly in the summer except that one. The last three pineapples I harvested from a different area were quite late and though they had excellent pineapple flavor they were not very sweet. I didn’t get to taste this late fruit as it disappeared before it began to ripen. I am guessing one of the creatures of the woods got it. It is March now and I have many pineapples that have begun flowering as well as an early bloomer that is nearly full sized already. When Hurricane Sandy sent tropical storm force winds ashore while passing by Florida, the shady hedge plants on the south side of my property came down. We cut it all up, putting the logs aside, moved a compost heap that was suddenly in full sun, and made a new garden with the logs and a pile of broke down manure. 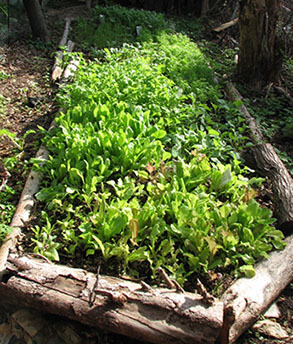 That garden is soaking up the best sun on the property,and producing well. This garden went in when a 15 foot tall hedge came down. One of my annual garden areas is succumbing to a managed succession to perennial food crops. That is, it is getting less sun than the winter before, so the annuals there are having a slow start this season and will be producing later than other areas of the property. 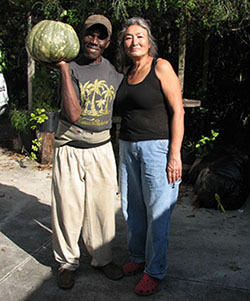 In that garden I had a good seminole pumpkin crop over the summer culminating in a hidden pumpkin suddenly becoming visible hanging in the loquat tree. It weighed in at seventeen and a half pounds. The first one I plucked from that tree was big at eleven and a half pounds. The vines from that pumpkin plant are still alive and traveling around the garden. If the winter weather remains mild I expect that same plant will continue its roam around the garden next summer too. If not, I have more seeds. I really enjoy the hidden fruits and the surprise fallen fruits that suddenly become visible. It is interesting to discover that the fallen pumpkins I have found on the ground so far even though they have shown signs of having been on the ground for long enough to have rotted were not decomposing. I have even picked up pumpkins that were a quarter buried in the ground where they fell and earthworms were busy in the soil beneath, but the skin of the pumpkin remained intact. The banana plants that are growing in the chicken litter are humongous. The flowers I have been waiting for have emerged, and I can count 6 hands so far. This year I won’t be climbing for bananas, they have grown too tall. I will have to pull the plant down to get the fruit. Passion vines are still producing in that area, but as I have done all summer long, I am sharing with squirrels. The carambola tree is loaded with fruit and we have had the pleasure of eating star fruit every day. The papaya has lots of fruit on and I am hoping for ripe fruit, squirrels willing. The loquat tree had lots of fruit, but it wasn’t very good this year. Below it a new rose apple is growing well. Below the rose apple I have collard greens, lambs ear and vanilla grass and now summer crisp lettuce seedlings. My other new fruit trees white sapote, olive, almond, and lychee are doing well so far. If they are as well in the spring it will be a great summer for them. The mango tree, and the Choquette avocado tree (It makes football sized avocados.) are in full bloom madness. At the shed area I am still battling with running bamboo. Some friends helped me dismantle a hugel mound and we began to dig out the bamboo that had invaded it. I reassembled the hugel mound and planted fingerling potatoes in it. Nearby, where Rattlesnake beans grew this summer I have sugar snap peas up and running, with stinging nettles and some kale, lettuce, broccoli and parsley transplants there as well. A volunteer rattlesnake bean has joined the climbing mass of peas and I am harvesting those sweet purple spotted green beans along with the peas. Near the pea garden I planted a mound in clover and tomatoes. Papaya volunteers came up there too. Now I have papaya plants with tomato plants and a clover understory that is keeping the soil covered below. It is such a cool garden, and even though it is mounded nearly two feet up from ground level it rarely needs water. 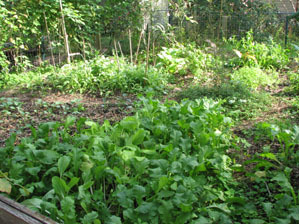 The shed garden vege patch is doing real well. I have had to disassemble it every summer to remove the bamboo that runs into it. This summer was no exception, and I have already clipped bamboo shoots this fall, so I know what I will be doing again next summer. East of the shed garden vege patch I put in wheat and a good bit of sweet white clover. A gopher tortoise ate down my entire first and second wheat crops. I have since covered that area over and planted corn and more clover, and yeah I will go ahead and fence in the corn against the tortoise. I was surprised to discover that the tortoise does not seem to be the least bit interested in the clover. I ran out of space for the transplants I was thinning from the gardens I seeded. 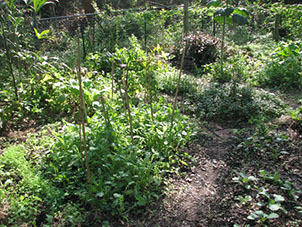 In desperation I moved cabbages and broccoli to the mulch around young fruit trees. I have found that a handful of rotting manure encourages their development in the fruit tree mulch. It is a good practice for me to move annuals out into beds with perennials. I often miss obvious spaces for transplants because I was, until recently, unaccustomed to mixing annuals with perennials. 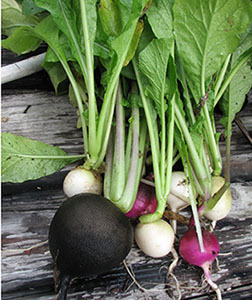 I have been harvesting salad greens and radishes for months now. I have just begun to harvest cooking greens and now the broccoli is flowering. A broccoli plant that limped through the summer when all the others were dead became vibrant in October and was providing me with lovely side shoots before the new broccoli crop had gotten up six inches. 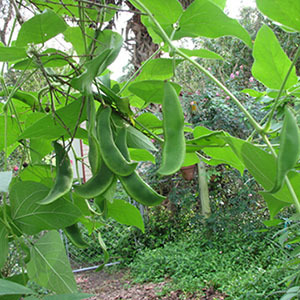 I am allowing it to go to flower now and have been collecting mature seed pods from it for next fall’s planting season. While the broccoli plants have been large and vigorous this year the florets even the first center florets have been small. Since this is happening in all of my gardens, and I have heard the same from some of my friends, I wonder if it is because of the record warm temperatures we have experienced this winter. I am making an effort to harvest carrots following our cold snaps. I think that gives the best chance for sweet carrots in a rather warm growing season. They taste good so far, but not as delicious as the nearly translucent super sweet carrots I harvested after 2 straight weeks of mostly freezing night time temperatures we experienced a few years ago. We have been eating lots of Lima beans and there are still lots of beans on the vines. I am surprised to see that the lima plants do not seem to mind the few cold nights that we have had so far. Certified Tree Service came out during the summer and thinned the vines in the woods on the east and south of the circle garden. It was amazing how the air came through after they were done. The garden is getting better sun too and is growing very well. There is some of everything in the circle garden including a non-native chickweed that I am hoping will become native to my garden. It is very delicious, and grows just as vigorously as the native chick weed does. This is how it goes in the natural garden where most of my time is spent planting and harvesting and none of my time is spent battling with insects, or throwing fertilizers. Totally fascinating as always–always something new and something I knew about (but didn’t know that much about). Are you married Adina? Your articles are well written and informative. Hi Stone, Thanks for your comment. I am exhausted too. Our extremely rainy summer has proven to be very good for our turmeric plants. I may have some turmeric I can send your way. I won’t know until it is harvest time in the fall, but you would have to keep it warm and dry over the winter so that you have viable roots to plant in the spring. 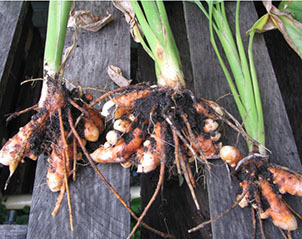 You might also check out my Hawaaian turmeric resource: East Branch Ginger. They ship in the spring.